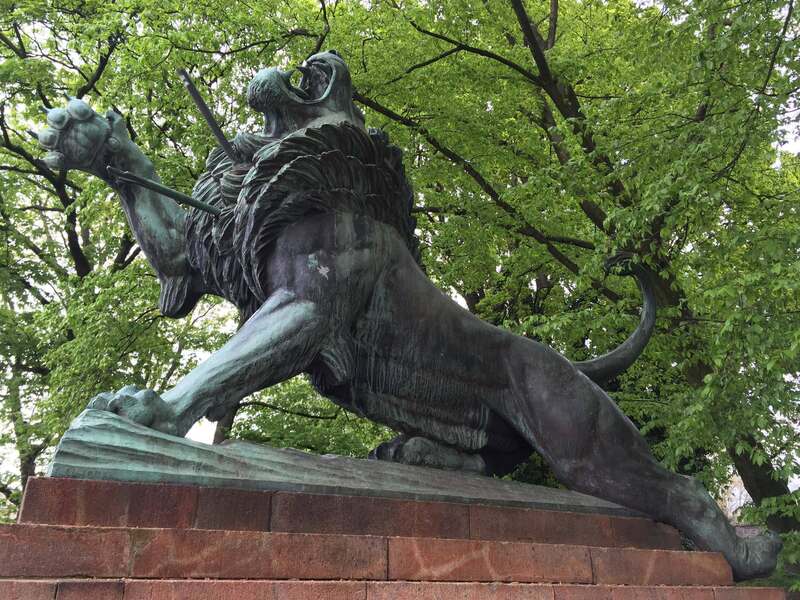 4/23/16: The statue in the photo is in Darmstadt. It is a memorial to casualties of the world wars, but looking at it I was reminded of Europe’s attitude toward energy consumption. The two arrows in its chest have been fired by Europe, one arrow to end the extraction of fossil fuels and the other the end the reign of nuclear power, and the beast of destructive consumption is in its death throes. It is palpable over here. Germany is phasing out nuclear energy by 2022, and the EU has a goal to be carbon neutral by 2050, with lots of encouraging intermediate steps. Not that it will go gently, but it will go. The 20th International Passive House Conference closed last night with a very thought provoking panel discussion between three unique, dedicated and sincere public personalities. The panel consisted of Professor Dr. Wolfgang Feist himself, who is synonymous with Passivhaus and was like the energizer bunny for the entire conference, Ernst Ulrich von Weizsäcker, with a resume of public service a mile long, currently co-President of the Club of Rome, an international think tank whose mission is to develop solutions to the gravest challenges facing humanity, and Franz Alt, a best selling author and climate change activist whose most recent book is a statement from the Dali Lama whom he has interviewed 30 times. I was able to chat with Prof. von Weizsäcker earlier in the day and was struck by his world-class intelligence and warm humanity. Professor Feist is himself personally humble while supremely arrogant in his aspirations for the scope and impact of Passive House. The panel discussion quickly went global. These men are united in seeing climate change as inextricably bound to wealth inequality, the grinding effects of unregulated capitalism, war and the global refugee crisis. Prof. von Weizsäcker referred repeatedly to Pope Francis’ encyclical Laudato si’ because it confronts the underlying attitudes especially among the masters of capital who, in their treatment of all of nature — including mankind — as a commodity to be exploited, are pushing humanity quickly toward the brink in so many areas. Both he and Mr. Alt demonstrate a deep respect for Dr. Feist and feel that Passive House is totally relevant on the world stage. Dr. Feist said that this year’s turn out of over 1,000 participants was the largest yet, and was particularly pleased to see China jumping in with both feet by sending 200 people. Free of the anti-Chinese bias in the American press, one gets the impression that German engineering and diligence mixed with Chinese ambition is going to take them far. The room was electric, as was much of the conference, with people clearly feeling they were in the right place at the right time. The three men were all very happy with the news that 175 countries had just signed the Paris Climate Accords in New York, on Earth Day. One takeaway from this conference is that our American government is going to need to get with the program at every level. As Prof. von Weizsäcker said, the world-wide fashion of scorning politics and politicians needs to give way to a more fruitful spirit of partnership for energy efficiency to gain much traction. The free market is not going to make this happen any time soon because it is in bed with the extraction and consumption of fossil fuels. Many Passive House architects, engineers and consultants from many other countries showed us how much work they are doing successfully not only for private companies and home owners but also in subsidized “social” housing and in schools, obviously in partnership with federal, state and/or local governments. Though America was under represented at the conference, Dr. Feist was very excited to hear the news that the Manhattan Borough Board had passed a resolution on April 21 promoting Passive House standards in the building codes. My feeling is if America puts its mind to this, watch us go. The world is watching, skeptically, but it certainly isn’t waiting. A surprising emphasis among the Passive House leaders is that there is plenty of energy for everyone in every part of the world. Renewable energy is decentralized in that every town, every home, every building, even every nomadic tent can generate its own. And Dr. Feist further emphasized every chance he got that energy efficiency, which he sees as a form of renewable energy in itself, is also completely decentralized. We are passing from the age of the faceless monoliths – huge machines digging and drilling, enormous energy plants sending pipes and wires in every direction — to the age of locally grown energy and energy efficiency.